Venus’ Day with full Moon in Libra on a gorgeous spring day is truly a gift from the Gods! Even before I pulled today’s Lenormand trio, I knew this draw must be exceptionally positive. 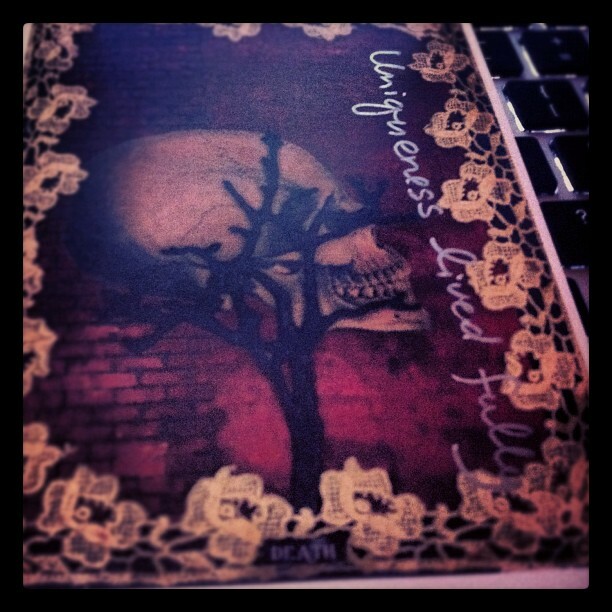 The deck I used for today’s divination is the Gypsy Lenormand Oracle Deck. In addition, I used the Red Owl deck to help shed more traditional light on the imagery and meanings. I feel that pulling from the Gypsy Lenormand was a fortunate choice because after I laid down the cards I realized that two of the three images are encompassed in circular designs — how appropriate for a Full Moon. Without a question, all of three cards scream SPRIGN! One of Bouquet’s actual definitions is Spring, along with wondrous things like beauty, gifts, dates, and recovery. The Tree stands for health, and surrounded by two such positive cards it represents good health and gifts of regeneration. It also stands for genealogy; with roots deep in the kingdom if father time, the strong evergreen is reminiscent of the awesome power we hold through out connection with our ancestors. Remember those on whose shoulders you stand as you celebrate the beauty of this Full Moon. The Ring is also circular like the moon. Cycles, beginning and ends, gently flow into each other. A lover’s promise materializes into a beautiful jewel under Luna’s magical gaze. If you were waiting for a romantic proposal, tonight might be your lucky night. Together these cards bring forth the power to heal and regenerate. They communicate of the awesomeness of Spring; whispering of fruitful possibilities, and of hopeful outcomes. A sentiment of romance, along with a holistic sense of spirituality and karma, all present in today’s draw. Weave these images into your meditation. Display them ceremoniously on your altar. And accept the spiritual fruits and blessings of today’s radiant Moon. Yesterday I receive a new tarot deck that I purchased on Etsy. 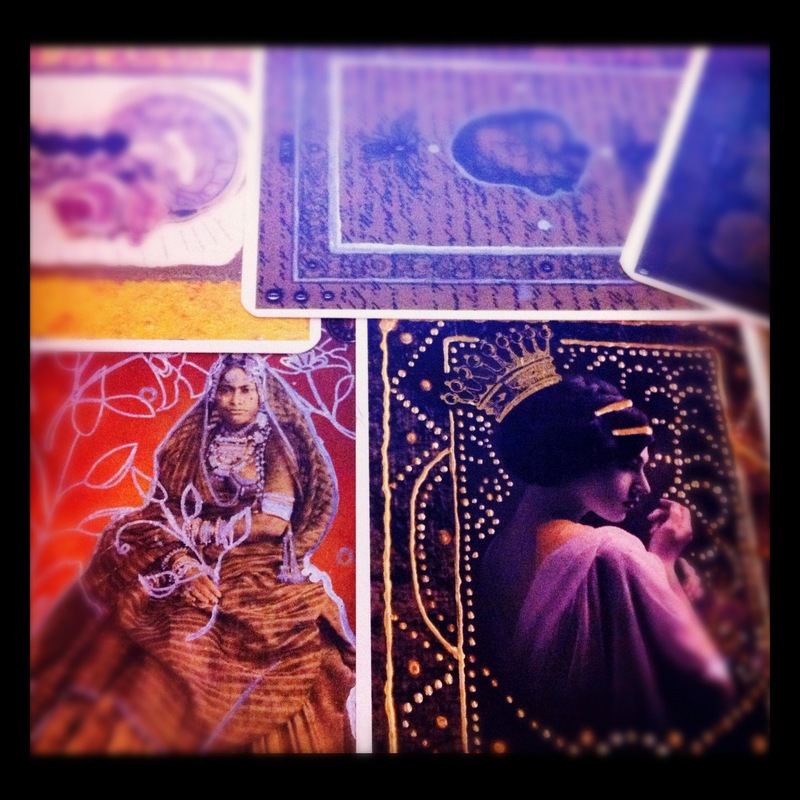 The Silent Tarot is a multimedia hand-crafted art project. Basing her images mainly on the RWS tradition, the artist, who goes by Esmeralda M. Rupp-Spangle, replaced three of the traditional suits’ names: wands are renamed Sticks; the suit of cups became Hearts; and disks / pentacles turned into Coins. Hence, the Hearts suit appear as actual, biological hearts. Coins look like actual coins. And Sticks are presented in several different ways — as sticks, pencils, and even as bones. A lot of the bone imagery appearing in the pack reminds me of a dog’s ankle bone I use in my bone divination kit — for me this creates a greater affinity for the deck, especially because a dog’s ankle bone represents loyalty and support. 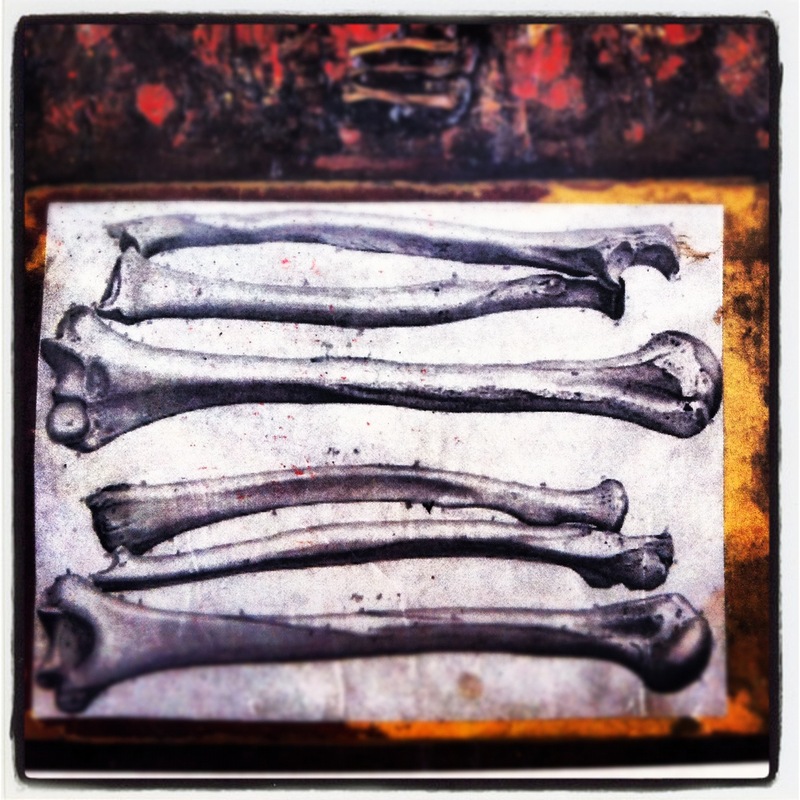 An excerpt of 6 of Sticks from the Silent Tarot that illustrates images of bones, similar to a Dog Ankle bone in my divination kit. The Silent Tarot has a unique, and somewhat deliciously morbid, artistic look. As a fan of multimedia in general, and collage art in particular, I immediately was drawn to this deck. Esmeralda has an informative YouTube channel where she shows the making of individual cards, revealing the artistic process of the pack’s creation. The cards are VERY busy, but in a good way. These will work for you if you happen to be a fan of multimedia art. The images are vibrantly printed on 100lb matte card, with the layering of various media reflecting through the high quality scan and print process. Fleur-de-lis happens to be one of my favorite symbols. The cards are larger than a normal tarot deck, measuring 4.25 x 5.75 inches. The backs are reminiscent of traditional playing cards, with a red Fleur-de-lis pattern printed over white backgrounds. The card stock is a bit flimsy, which seems to be a trend with the self-published decks on Etsy. In my opinion, the stock feels very similar to the stock quality of the Steampunk Tarot by Charissa Drengsen. [Check out my detailed video review of the Steampunk Tarot, if want to know more about this deck]. Nonetheless, the redeeming quality of the thin card stock is the vintage flare of the pack and the large size of cards. When I shuffle Silent Tarot I feel as if I am manipulating an unbound book of magical pages. An enjoyable sensation that puts me in the mood for fortunetelling. If you have small hands, or not a fan of large cards in general, I am not sure you’ll enjoy this aspect of the deck as much. Finally, even before holding Silent Tarot in person, I knew that there’s one alteration I must make. In some circles it is considered hearsay, and I do hope the artist won’t be upset with me. 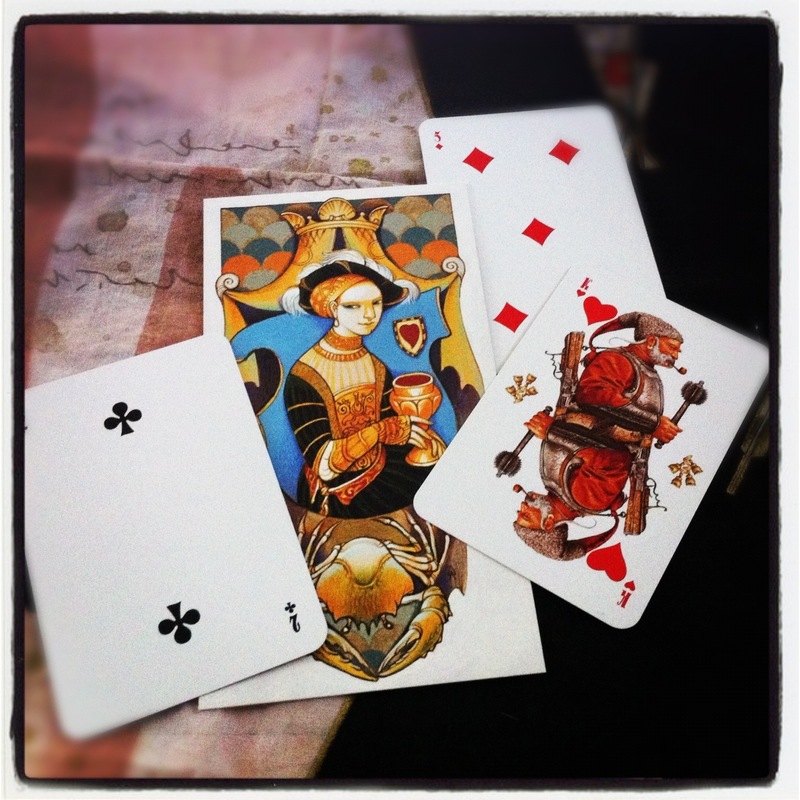 But as soon as I saw the images online I knew I wanted to inscribe the meanings of the cards right on top of the image. Somehow, considering the deck’s artistic background, it felt appropriate. I’ve never done this before. So last night I spent 3 hours digging for definitions in several of my tarot books, and inscribing the ones that felt intuitively appropriate onto the cards. 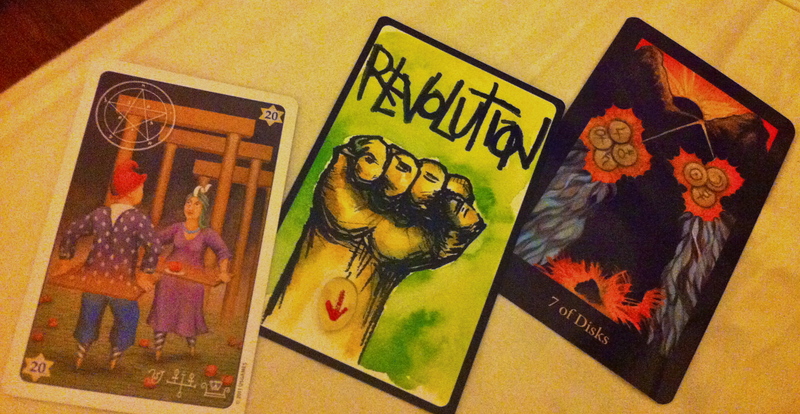 I can’t describe how wonderful it felt, and how much more personalized the Silent Tarot is to me now. 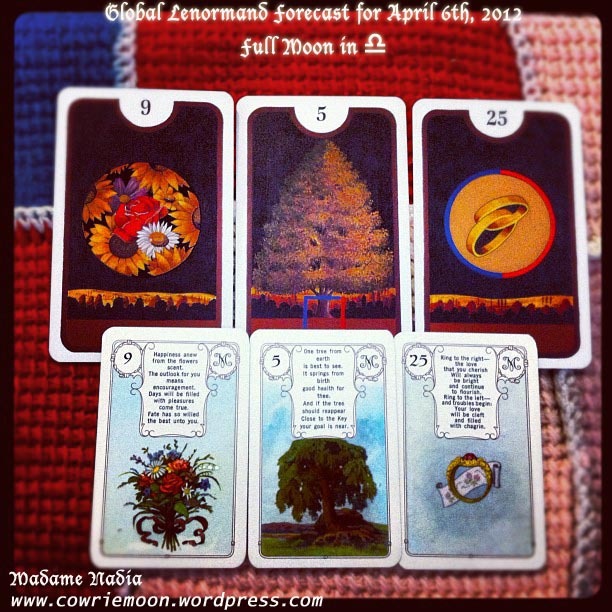 Before I went to sleep, at 4 am, I picked a card to serve as a Global Forecast for April 5th, 2012. I pulled major number 13 — Death. Memento Mori, so you can live today to the fullest! In this time of transitions and regeneration, your personal uniqueness must be lived fully. Realize that inauthenticity eats away from your true happiness. Letting go is painful, yet necessary. Memento Mori, and live today to the fullest.